Follow your media coverage with local and international sources. Improve your market knowledge with global business data, premium news and insight on millions of public & private companies, industries and executives from thousands of sources. Supplier of international and tailor-made monitoring services. Get access to the most comprehensive economic, financial, and political coverage of countries, regions, and industries available from any source-covering over 200 countries. Tap on specific news, verified by the AEF news agency. Get visibility into key events, activities and investments for your prospects and clients in the short, medium and long term. Detect business signals thanks to a sales intelligence solution in order to not miss any strategic move in your ecosystem. Do not miss any key information in the building & construction industry. Join 1 million researchers who already use Source Direct and access a thorough scientific base. Access the largest database of scientific citations and abstracts. Benefit from data and solutions dedicated to the Insurance sector. Access to a monitoring solution dedicated to the Insurance sector. Anticipate external risks through the deep & dark web monitoring. 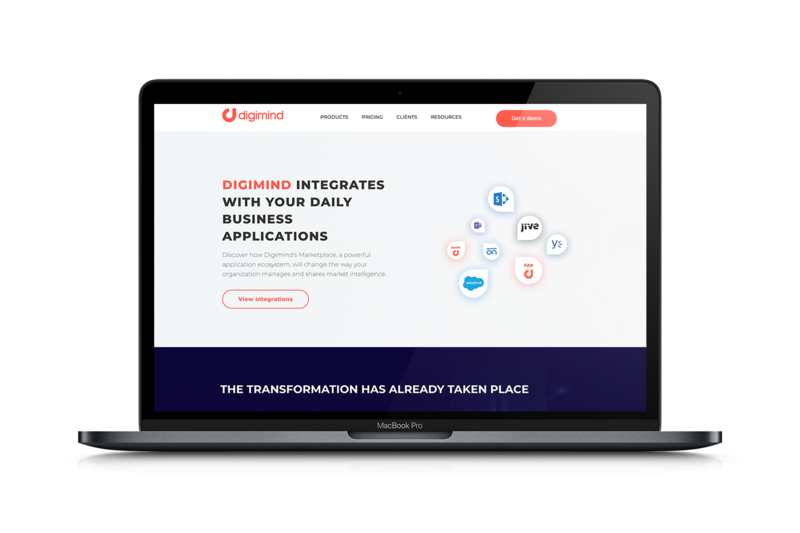 Connect your Digimind Intelligence platform to Salesforce CRM to improve clients' insights. Identify through Digimind Social prospects who expressed interest in your product, and turn them into leads from the Salesforce CRM. Feed your Jive communities with Market Intelligence data to improve their dissemination. Facilitate business users' access to qualified content on various topics in their SharePoint collaboration sites. Tap into the power of a corporate social network to nurture your communities with qualified content from Digimind Intelligence. Improve sharing, engagement, and interaction among your coworkers by connecting Digimind Intelligence to your Microsoft Team collaboration platform. Enrich your monitoring by integrating comprehensive social content to capture the consumer's voice on innovations and follow the publications of influencers, experts or leaders on a specific topic. Reinforce trends monitoring by accessing 24-month historical data to gain insight into the media coverage of a topic, visualize key concepts around a topic, and identify new sources or influencers. Identify through Digimind Social prospects who expressed interest in your product, and turn them into leads from the HubSpot CRM. Import your Digimind Social feeds as new sources in Lithium, and display it in Lithium dashboards. Import your Digimind Social feeds as new sources in Socialbakers, and display it in Socialbakers dashboards. Identify through Digimind Social negative mentions about your product, and turn them into Zendesk tickets. Import your Digimind Social feeds as new sources in Hootsuite, and display it in Hootsuite dashboards. Import all Social Digimind insights into your account Table and cross them with insights from your other sources. Import all Digimind Social insights into Google Data Studio, and blend them with Google Analytics data, Google Sheets, or any other source connected to your Google Data Studio account.